Shelf Inflicted: Have Fun Storming the Memoir! Have Fun Storming the Memoir! Your reaction to this memoir will depend on how much you like Billy Crystal's comedy style. I'm meh about him, so I'm meh about this book. Other reviewers who adore him liked this book a lot more than I did. 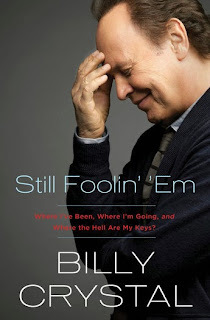 Billy is now 65, which he will tell you over and over again, and several chapters are devoted to his shtick about getting old. There's nothing new here, except discovering that Billy has become a cranky old man, cursing about social media and teenagers and politics. Speaking of cursing, it was a bit shocking to hear Billy drop so many F-bombs. For decades now Billy has nurtured the persona of the sweet, goofy, schmaltzy, aw-shucks guy, and I was surprised to hear him swear so much. But I'm focusing too much on the negative. The parts I liked were the stories of how he got started in comedy and the behind-the-scenes anecdotes of his movies and TV shows. He talks about making "When Harry Met Sally," "City Slickers," "The Princess Bride," about hosting the Oscars and about visiting Russia for the comedy special "Midnight Train to Moscow." He also had good stories of his famous friends, such as Mickey Mantle, Sammy Davis Jr. and Muhammad Ali. One of Billy's early famous bits was his impression of Ali, and the two men became close, with Ali calling Billy "Little Brother" whenever they'd meet. Billy also shared some nice family moments, such as the day his first daughter got married, and how much he likes being a grandfather. There were some emotional chapters, like when his dad died when Billy was 15, and how he later wrote those childhood memories into the Broadway show "700 Sundays." I listened to this book on audio CD, and parts of it were performed in front of a live studio audience. Again, your reaction to this will depend on how much you like listening to Billy. He reprises all of his famous impressions, including Ali, Mantle, Sammy, Howard Cosell, "You look MAH-velous!" and the voice of Miracle Max. While I enjoyed most of the performance, at times I found it tedious and wished he would wrap it up already. Oy.